Author(s): Ahmad Hussain, Shahid Ali, Iqbal Ahmed, Center of Excellence in Desalination Technology, King Abdulaziz University, P.O. Box 80200, Jeddah 21589, Saudi Arabia. Jolius Gimbun, Muhammad H. Albeirutty, Zulfiqar Ahmad Rehan, Jolius Gimbun. 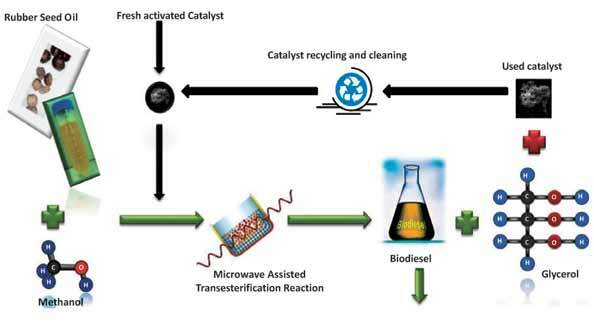 In this study, the potential of limestone based catalyst on microwave assisted closed heating transesterification of Malaysian rubber seed oil (RSO) which is rich in high Free Fatty Acid (FFA) was investigated. The experimental results showed that the conversion of high FFA oil to biodiesel is very efficient compared to various catalysts. The catalytic activity is not negatively affected by the free fatty acids and can be recycled very easily. Brunauer–Emmett–Teller (BET) analysis was also used to find the surface area of the catalyst at each cycle. The highest conversion achieved was 96.80% with catalyst concentration of 6 wt%; methanol to oil molar ratio of 5:1; reaction temperature of 60°C and reaction time of 60 minutes. The biodiesel produced is within the limits being prescribed by ASTM D 6751. Keywords: Calcination, cement clinker catlayst (CCC), Microwave assisted transesterification (MAT), Rubber seed oil (RSO), Scanning Electron Microscopy (SEM). Affiliation:Center of Excellence in Desalination Technology, King Abdulaziz University, P.O. Box 80200, Jeddah 21589, Saudi Arabia. Keywords:Calcination, cement clinker catlayst (CCC), Microwave assisted transesterification (MAT), Rubber seed oil (RSO), Scanning Electron Microscopy (SEM). Abstract:In this study, the potential of limestone based catalyst on microwave assisted closed heating transesterification of Malaysian rubber seed oil (RSO) which is rich in high Free Fatty Acid (FFA) was investigated. The experimental results showed that the conversion of high FFA oil to biodiesel is very efficient compared to various catalysts. The catalytic activity is not negatively affected by the free fatty acids and can be recycled very easily. Brunauer–Emmett–Teller (BET) analysis was also used to find the surface area of the catalyst at each cycle. The highest conversion achieved was 96.80% with catalyst concentration of 6 wt%; methanol to oil molar ratio of 5:1; reaction temperature of 60°C and reaction time of 60 minutes. The biodiesel produced is within the limits being prescribed by ASTM D 6751.